Antidesma cumingii M¨¹ll.Arg. in DC. Antidesma tomentosum var. giganteum Pax & K.Hoffm. Antidesma tomentosum var. rivulare (Merr.) Pax & K.Hoffm. in Engl. Leaves: petioles 3-15(-20) by 2-5 mm; blades elliptic to slightly obovate, ovate or oblong, (3-)5-12(-30) cm wide, length/width ratio (2-)2.5-3.5(-5.5), apically long acuminate-mucronate. Staminate inflorescences 6-14 cm long, simple, very rarely 2-3 per fascicle. Pistillate inflorescences (5-)10-30 cm long. Infructescences 10-30(-65) cm long; fruiting pedicels 1-7(-23) mm long. Fruits obliquely ovoid (mango-shaped) to falcate, often slightly beaked, 5-8(-9) mm wide. In primary and secondary evergreen vegetation; in mixed lowland to hill dipterocarp forest; in mossy, montane rainforest; in dry shrubby heath forest on poor sand (kerangas); in swamp and riverine forest, sometimes subject to flooding; in plantations; along road sides and forest edges; in thickets; in wet to dry habitats. On clay, sand and ultrabasic soil, over limestone, granite or sandstone. Altitude: sea level up to 800 m.
The hard wood is used for making ploughs. 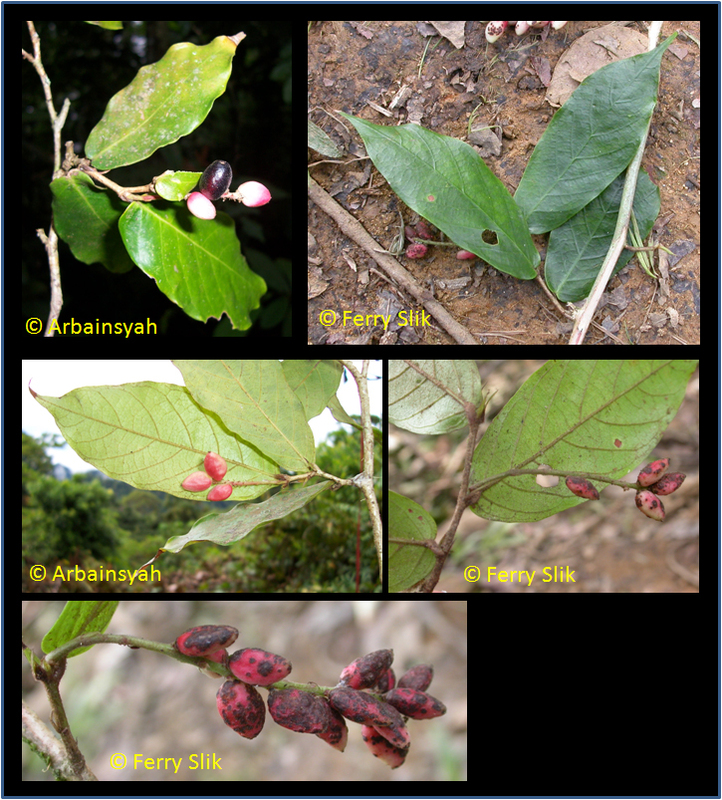 The ripe fruits are eaten in Java (Smith, Meded. Deptg. Landb. Ned.-Indi? 12, 1910: 265). The roots are chewed and applied for internal pain (Philippines, PNH 38075). The bark is burned and the ash is rubbed on the teeth to colour them (Philippines, PNH 13524). Peninsular Thailand, Malaysia, Sumatra, Java, Borneo, Sulawesi and the Philippines. Borneo: Sabah: Adadsay (Dusun), Balinsaay (Dusun), Kansali, Kobar, Kobor or Kubor (Duson Banggi), Rayan (Kedayan), Siop nanah (Dusun); Sarawak: Sikandu (Land Dayak); Kalimantan: Kosa umpo, Kusiro rue, Passi haras, Sompa. Java: Ki seueur, Ki seueur lalaki [seueur = many, refers to the many edible fruits], Tampar kidang (all Sundanese). Malay Peninsula: Kayu sireh (Temuan). Philippines: Ata tamsi, Balerahay, Bongay (Manobo), Bungoy, Gelebiray (Sub. ), Malindang (Sub. ), Padit (Palanan-Agta), Tiga (Bukidnon).